“The Saudi NGOs pay for ISIL’s expenses in Anbar province under the cover of supporting the children of Fallujah city,” al-Hakim said, addressing a UN Security Council meeting in New York on Sunday. 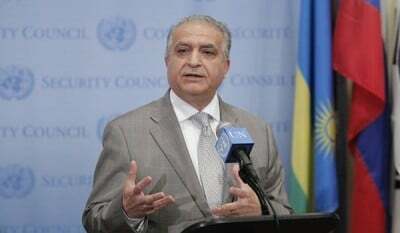 He said that the Iraqi foreign ministry has asked Riyadh to explain about the active religious and social organizations of Saudi Arabia that have sent aid to the ISIL under the guise of helping the Fallujah children. Al-Hakim called on the UN to act upon international resolutions and force Saudi Arabia and Turkey to stop their financial aids to ISIL. In a relevant development in early July, French media disclosed that the ISIL terrorist group has been purchasing a large volume of parts for its arms-manufacturing workshops in Fallujah 69 kilometers to the West of Baghdad. “Fallujah in Anbar province has turned into capital of the ISIL’s workshops which manufacture weapons and ammunition and has close cooperation with Turkish firm active in the field of supplying parts for arms-making factories,” Le Figaro reported. “There are at least 14 large arms workshops in Falluja, mostly located in residential area, mosques and even hospitals across Fallujah,” the paper said. “Based on a document, the ISIL in December 2015 manufactured at least three Grade missiles, and test-fired two more Fatah missiles. In February-March 2016, the ISIL made 15 Fatah missiles. The ISIL manufactured 2,500 missiles from Sep 2015 till May 2016 which means 10 missiles per day,” the paper added. “The ISIL purchased large number of parts, including explosive wires and frames of bombs for its arms workshops. Falluja in not the only city hosting ISIL’s arms workshops, there are similar plants in Tikrit, Ramadi, Southern side of Baghdad and even Kobani in Syria,” Le Figaro added. The secret reports of the Turkish police indicated in June that the Al-Nusra Front and ISIL terrorists use Turkey’s both legal and illegal border crossings to transfer weapons and ammunition to Syria. “Certain elements linked to terrorists in Syria are still shipping weapons and supplying their logistics from Turkey,” the Turkish-language daily, Karshi, cited a police report t the country’s public prosecutor about its operations in the city of Diyarbakir. The newspaper, meantime, said that certain communities have also provided financial supports for the terrorists fighting against Syrian President Bashar al-Assad’s government. The daily also said the Al-Nusra and ISIL terrorist groups have established bases in Turkey to train recruits, adding that many explosive devices are even manufactured and assembled on Turkish soils.